What's the difference between a wine bar and a restaurant with wine? These are the things I often think about in solitude. Normally, the answer would be that one has food and one does not, but these days the lines are blurry. Terroir is a wine bar, but they also have an excellent menu of things to eat while you drink. I think Corkbuzz is a wine bar, but the newest location has inexplicably been at the top of the Eater Heatmap for the last three months, so it must be a restaurant. I know Bar Veloce is a wine bar because I've only been there with a visitor from out of town, a date, or a group of girls who are overdressed for a Wednesday night. And let's be honest, those are the scenarios in which you most typically find yourself at a wine bar. As for Terra, I could go either way. 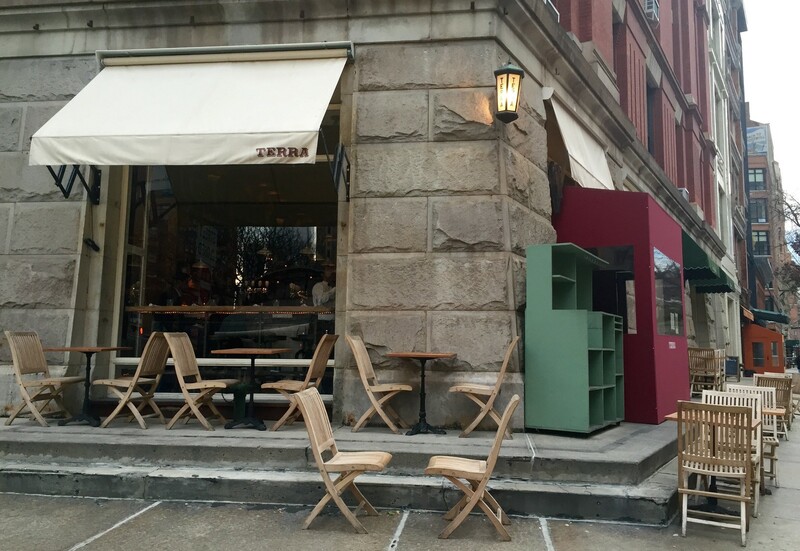 Part of me thinks this new Tribeca spot is a wine bar, because it's owned and operated by the same people responsible for Aria, the West Village's most rustic and hilarious place to drink Nebbiolo. But I also sort of think it's a restaurant, because of the fact that they have a huge kitchen that turns out fresh pasta and all of the other 47 things on their menu. The question then becomes, who cares what you call it? The short answer, is I do. Because I don't think you can call yourself a wine bar and then have poor options when it comes to wine. And before you fire up an email to me about how I probably don't know anything about wine and probably don't even know that Chianti can be really great, a) I get it and b) that's not what I'm talking about. I'm talking about the fact that the cheapest decent bottle here is in the $70 range, and it's not even one of those good value situations. The wine list here is just way too expensive. So maybe it's just a restaurant then. How's the food? Pretty solid actually. Especially if you lean heavy on the small plates portion of the menu, going big on things like fried artichokes and meatballs. The pastas are decent too, but not worthy of many more words on the subject. So, if Terra is a restaurant, it's an average one. And still an expensive one. The one thing we will say definitively about this place is that the room is amazing. It's dark, rustic, filled with candles, and even has great space for a big group and outdoor dining in the warmer months. So maybe it's neither a wine bar nor a restaurant. Maybe it's a place you come to have one glass of wine or maybe a cocktail, especially if you don't mind spending some money. And maybe down here Tribeca, that's all it needs to be. Beef meatballs in tomato sauce. Very much good. Order them. Fried artichokes and olives. Salty and delicious. A good thing to compliment pricey wine. One of our favorite things here at Terra. Perfectly seasoned and highly pleasing. A perfectly good plate of tiny lamb chops to eat with your hands. Do that. We wanted to love the pasta here, and we could go into each of the six we've had in detail, but that would be a waste of time. Generally, feel free to order from this section of the menu, just don't expect much. It's all pretty unremarkable.